Habit at Kula Ace Hardware and Nursery, Maui, Hawaii (USA). September 06, 2007. Origin and Habitat: Garden origin. Acanthocereus floridanus f. monstruosa hort. Succulenta (Netherlands) 20: . 1938 cf. Gray Herb. Card Cat. Cereus acutangulus Otto in Pfeiff. Cereus prismaticus (Willd.) Haw. ex Steud. Description: “Fairytale castle”, Fairy castle” or “Green finger” cactus is the evocative name by which this common succulent plant is marketed and refers to the numerous vertical stems of different heights that resemble spires and turrets. This diminutive cultivars 'Fairy Castle' was discovered in cultivation and is a very popular plant often found in the succulent part of the box retail stores. Some expert classify the cactus as a monstrous form of Acanthocereus tetragonus (Acanthocereus floridianus), but the true self of this plant is controversial and some suggest that it may be a form of Cereus hildmannianus or even a dwarf form of Cereus hildmannianus subs. uruguayanus. Whichever scientific name is correct, the plant is a delightful cactus. Habit: It is a miniature columnar cactus species that branches like a mad and will slowly form a crowded pyramidal mass of green stems to about one metre in height. Overall effect is of a "castle" shape, with literally hundreds of branches and branchlets. Stem: The main stem is five sided, with short spines along the ribs, and offsets profusely to form smaller upright branches which, in turn, offset profusely with smaller finger-like offsets. Flowers: The fairy castle cactus rarely blooms. Areoles: Conspicuous, white and woolly. Spines: Few, bristle-like, short, creamy-white. Acanthocereus tetragonus cv. Fairytale castle: it is diminutive monstrous cultivars forming quite large clumps of several hundreds vertical offsets of different heights that resemble spires and turrets. 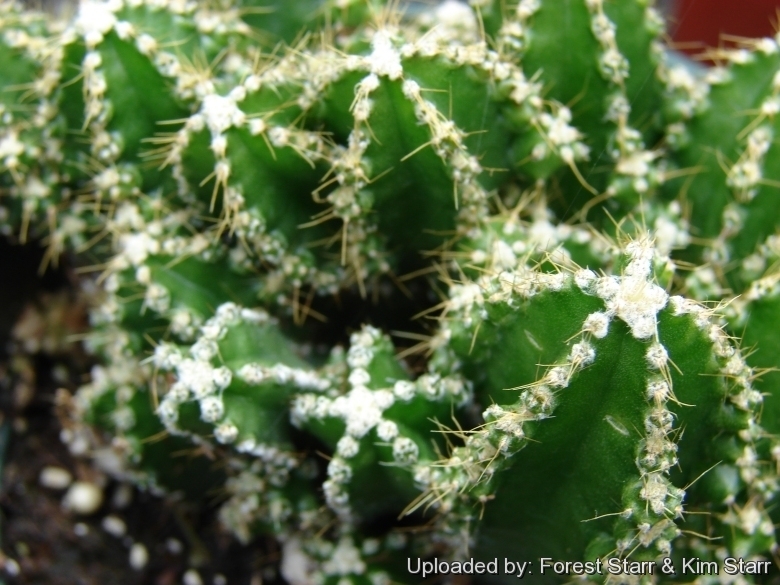 Forest & Kim Starr Cereus peruvianus (Hedge cactus, apple cactus)). Plants of Hawaii. <http://www.starrenvironmental.com>. Downloaded on 21 August 2014. Cultivation and Propagation: Fairy Castle Cactus grows well on its own roots and will form quite large clumps of several hundreds offsets, if given time and grown properly. Growing fairy castle cactus inside your home is an easy beginning gardener project. Soils: For pot culture it needs standard cactus soil. Outdoors needs well drained spots, with deep soil, but will still thrive in less than ideal conditions. The species may be sensitive to salinity. Repotting: It needs plenty of space for its roots. Repotting should be done every other year, or when the plant has outgrown its pot. Use pot with good drainage. Exposure: It needs bright light, and some direct sun, but avoid direct afternoon sun in summer. Bright, warm window seat in summer enjoy being outdoors, but slowly get used to the sun. Place the little cactus in a bright sunny location that is away from drafts or air conditioning. Hardiness: It is semi hardy, make sure that your Cereus are not exposed to temperatures below 0°C or they may die, nevertheless it is a good advice never let the nighttimes temperatures fall below 10°C. Prefers warmer winter temperatures, protect from frosts and freezes. Waterings: Water thoroughly during the growing season when soil is dry to the touch. Need a well-drained soil mix with small gravel added to ensure drainage. Less or no water during cold winter months to prevent root loss. Fertilize with in spring. Suspend the feeding in winter. Pest and diseases: Fairy Castle Cactus is susceptible to a disease that often cause its tops to rot, spreading to the rest of the plant. Keep well ventilated as it is prone to root rot too.